Remember the movie Titanic? Rose and Jack are standing at the hull of that infamous ship, he's holding her and she has her arms outstretched as if she could fly? The romance, the grandeur, the excitement of seeing that magnificent ocean liner made watching James Cameron's film an unforgettable experience. This year we celebrate that ship's 100th anniversary and now that you've seen the movie in its 3-D splendor, think about this: imagine a rich man who happens to be your college buddy has told you he's building another ship just like the Titanic and you've been invited on its maiden voyage. Would you go? This is the set-up for Trevor Hughes, the main character in Bill Walker's latest novel, Titanic 2012. We welcome you to today's tour. Blurb: Best-selling mystery novelist Trevor Hughes has no idea that attending his twentieth reunion at Harvard will forever change his life. Persuaded to go by his on-again-off-again girlfriend, Dr. Julia Magnusson, he meets up with three old friends: Solly Rubens, a self-made Wall Street millionaire; Ken Faust, a successful software entrepreneur; and Harlan Astor, New York real estate tycoon and the glue that holds their circle together. That afternoon, over drinks at the Harvard Club, Harlan drops his bombshell: He is doing what James Cameron did not -- he is rebuilding the Titanic, and sailing the ship on the hundredth anniversary to honor those who died, including his great-grandfather, John Jacob Astor IV. Only Trevor is intrigued by Harlan's audacity. Touched by his friend's interest and concern, Harlan invites him on the maiden voyage to serve as the official chronicler. On April 10, 2012, Trevor journeys to Southampton and, along with the hundreds of handpicked passengers, boards the Titanic. He is awed by the immensity of the ship and the feelings that well up in him. His friend has made his grand dream a reality. During the journey, armed with his iPod Touch and a miniature wireless camera hidden in his glasses, Trevor interviews both passengers and crew, eager to learn the reasons why they chose to sail on the reborn ship. Nearly every one of them claims to have been profoundly affected by Cameron's film, wanting to recapture the magic for themselves. And some of them are dying -- their last wish to be on the maiden voyage of the new Titanic. Trevor is touched that his friend has allowed these people to come aboard, and is unprepared when he meets Madeleine Regehr, a beautiful, free-spirited woman who resists his entreaties to be interviewed, intriguing Trevor all the more. Slowly, and inexorably, Maddy draws him out of his shell, allowing him to love deeply and completely, for the very first time in his life. The furor in the media had just died down when Solly’s call came that rainy midweek day. I’d been hiding from the wolves of the fourth estate for nearly three weeks, holed up in my book-filled condo/prison in Charlestown, unable even to slip outside for a breath of fresh air without some cookie-cutter reporter, with a paint-by-numbers smile, sticking a microphone in my face and asking me the same tired question: "What was it like?" As if the whole of my experience could be quantified in a sound bite. Truth was I was avoiding everyone, even Julia and her earnest attempts to help me sort through the miasma of doubt and pain. And what was worse, the book I’d promised my publisher, the one that was supposed to chronicle all I’d been through, lay like a beached whale on the shore of my imagination. I was standing at the bay window overlooking the harbor, watching the rain sluice down the glass, wondering if I would ever have the courage to write again, when my gaze shifted to the pile of DVDs lying in a scattered heap on the teakwood coffee table. My eyes filled with tears yet again. "I’m so sorry, Maddy," I groaned, knocking my forehead against the cool glass. "I’m so goddamned sorry." "You have a call," the computer intoned in a quiet contralto, making me wince. Even the goddamned computer’s voice reminded me of Madeleine. "Who is it?" I asked, expecting to hear it was yet another call from the Globe. Hometown reporters were the worst, the most ravenous. And then I remembered I’d instructed the computer to screen all calls, allowing access to only a select few. "The caller has an Identity Block in place. Shall I take a message?" To hell with it. I had to rejoin the human race at some point, even if I felt as if I no longer belonged in it. "Put it through," I said, making my way over to the sleek MacBook Pro sitting atop my writing desk. The screen came to life and Solly Rubens’ round face filled the screen. His saturnine looks were etched with concern, an expression that somehow looked ominous on him. "Hey, Hughes, you okay? How are you holding up?" The tiny "picture-in-picture" in the upper left-hand corner of the screen showed me what Solly was seeing, rendering his question moot. I looked as if I’d taken the cook’s tour of Hell: blue eyes--red-rimmed and puffy--surrounded by dark circles, sandy hair greasy and disheveled, three-day growth of a patchy red-flecked beard, and the same clothes I’d worn since Monday. I looked sixty-two, instead of forty-two. All in all, I presented a picture about as far as one could get from what Boston magazine had called: "The World’s Most Eligible Author." "How the hell do you think I’m holding up?" I said, staring back at Solly. His eyes blinked rapidly and I debated whether or not to instruct the MAC to disconnect, when he spoke again. "Aw, man, I’m sorry. I really put my foot in it, didn’t I?" he said, trying to appear contrite. "Listen, I know we’ve never been the best of pals, but we had some good times back in school, didn’t we? I mean, Christ, we’ve been through a hell of a lot since Harvard. You a hotshot writer. Me hittin’ the big time. I still can’t believe it’s been a year--"
"What do you want, Solly?" His porcine eyes darted somewhere off-screen, then riveted onto mine. "Ken and I thought you should get out of the house, maybe meet us at the Harvard Club. What do you say?" "I don’t want to talk about it." "You gotta talk about it sometime," he said, his Brooklyn tenor rising in pitch. "You’ve been avoiding us for weeks, you look like crap, and everybody--and I mean everybody’s--been trying to find out what the hell happened out there. And what about Julia? You shutting her out? You treatin’ her like dirt, too?" I resented him bringing her name up, only because I knew he was using her as leverage, and not out of any real concern for her feelings. Not that I was any better. "She’s none of your business, Solly. Leave her out of this." "All right, I’m sorry. But you know I’m right. You gotta get on with your life, for Christ’s sake. If you’re not gonna do it for yourself, do it for Harlan." I leaned forward, my nose practically touching the screen. "Where were you when Harlan needed the three of us? Huh? Where the hell were you when the chips were down? Taking Karen to another Broadway show?" Solly’s lips compressed into a thin angry line. "Okay, I deserved that. But Ken and I have a right to know what happened." So, that was it. Like everyone else, they wanted to know the truth about Harlan’s death--wanted to know all the gory details. Christ, they were no better than the goddamned muckrakers slinking around my front door. And why was it so important to Ken and Solly, anyway? Would it bring Harlan back? Would it bring any of them back? Why the hell couldn’t they just leave me alone? And then, all at once, the anger passed, as if someone had thrown a switch inside me. Suddenly, I wanted very badly to tell someone--anyone. And perhaps it was more than fitting to do it where it all began. "All right," I said. "I’ll meet you guys at the club, Friday night at six." Solly cracked a grin, revealing crooked yellow teeth. "It’ll do you good, Hughes, you’ll see." "Maybe.... But drinks and dinner are on you." "My pleasure. See you there." My thoughts: After the above first chapter grabbed me and kept me whizzing through its pages, all I can say is Titanic 2012 does not need another summary by me. What it does need are readers to experience it. Even if you're not a fan of James Cameron's cinematic opus, read this book. Bill Walker takes us on popular fiction writer Trevor Hughes' trip on board the new Titanic as he interviews passengers and listens to their stories. I was amused by the comparisons and connections to people in the movie and touched by many. As the voyage goes on, we see these people's joy turn to horror as the story unfolds. Don't expect me to give away any spoilers. 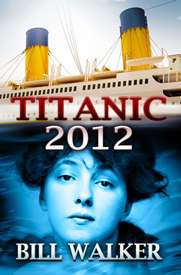 Titanic 2012 is a unique story filled with complex characters, mystery, excitement and romance. Wouldn't it be great to see this book made into a movie? Rating: I really enjoyed this. Source: From author for my honest review. About the author: A graduate of Emerson College's prestigious film school, Bill wrote and directed his first feature film, Pawn, while still a student. After graduation, he co-founded Newbury Filmworks, Inc., an award-winning production company renowned for making high-quality corporate films and commercials. In 1990, Bill relocated to Los Angeles, and began a freelance story analysis career for various studios and independent production companies, while devoting his spare time to the writing of novels, short stories, and screenplays. He is also a highly-respected graphic designer, specializing in book and dust jacket design. He has worked on books by such luminaries as: Ray Bradbury, Richard Matheson, Dean Koontz, and Stephen King. In addition, Bill is a member of the Authors Guild. He has won awards for his screenwriting, his two short story collections for Mid-Graders, Five-Minute Frights and Five-Minute Chillers, are perennial Halloween favorites, and his first novel, Titanic 2012was enthusiastically received by readers. His second novel, Camp Stalag was released in 2001. Bill lives in Los Angeles with his wife, Debbie, and their sons, Jeffrey and Brian. RADIO INTERVIEW: Bill Walker was interviewed on Blog Talk Radio. The interview is approximately an hour in length. This is the link and it will also be on his website. This tour is hosted by Partners in Crime tours. Thank you for your wonderful review. It's very much appreciated. Fantastic review and post. Well done. Thank you.